There's been numerous good sites on this (here: http://www.vmweekly.com/articles/cheap-esx-server-hardware/1/; and here: http://www.techhead.co.uk/building-a-low-cost-cheap-vmware-esx-test-server), but I started differently than most - rather than starting with something that's a pre-packaged, I like to buy the parts and roll up my sleeves. 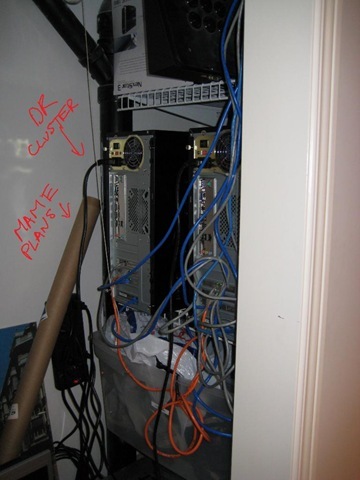 First - this is the view of the entry to the server closet, which is literally a closet with a "raised floor" - not for cabling and airflow, but rather so that when the basement inevitably floods, the gear is spared. It gets hot, so I put in an industrial thermocouple that acts as a cut-off of the dedicated 20A circuit I pulled in - for a shut-off just in case my sophisticated HVAC system fails. 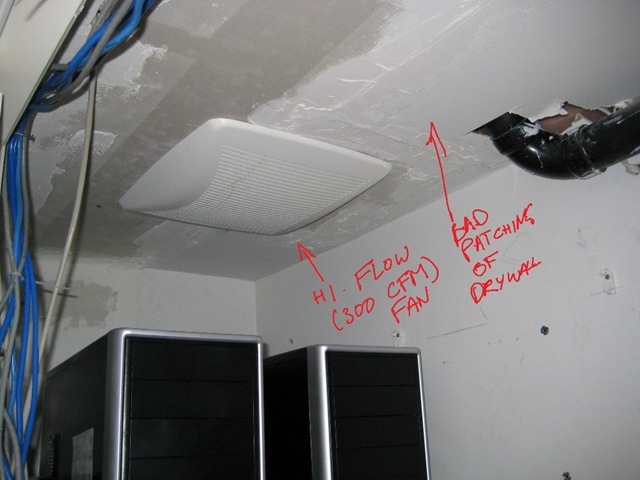 This is a quick shot of my sophisticated HVAC system. This rig generates a LOT of heat, particularly when I spin up the arrays. I bought a cheap 300CFM bathroom fan, and then tore apart all the drywall and vent it out. the intake is baffled, so when I close the door, the whole thing is pretty quiet. If this is making you eager to do the same thing - it's gotten ridiculously cheap, and ridiculously easy. I'm going outline how to build two ESX servers - one where you're looking for the CHEAPEST thing you can build, and one which is a little more pricey, but a great "bang/buck" ESX lab. Get a CPU that supports 64-bit guests - this is generally an Intel CPU that starts with the letter "Q" not the letter "E" (or just check the specs and look for VT support). Any Athlon 64 or opteron works. Can you go cheap - yeah, but that often costs you 64-bit guest support on Intel. If you're going cheap, I personally go AMD. Get a decent (but still super-cheap) GigE switch - something that supports VLANs so you can create configs that work with less physical NICs - it's crazy, but you can get an 8-port switch with full support for 802.1q, p, and everything else you could possibly need. Make sure you have a motherboard that has onboard VGA - you don't need a good graphics card, but you need something for initial config. This config leverages the fact there are ridiculously cheap multi-core CPUs and RAM these days. the NICs on Intel motherboards are usually based on older Intel or Realtek chipsets, (no driver support in VMware) - so you need to find some fancier (but still cheap) NICs. Name of the game here = how cheap can you build a powerhouse that you can run 10 VMs at once without breaking a sweat? You will need ESX Server and Virtual Center - within EMC, we have a VMware/EMC ELA (remember - VMware operates independent of EMC as the parent!). You can, of course, download the software from http://www.vmware.com/ - they have 60 day eval timeouts. WOW!!! I'm impressed and perplexed.... what do you use it for? You discussed all the "whats" and "hows" but not the "whys." Is it just for practice? Buy your supportive wife something special, "just for practice." So what's the "Why" - answer - it's important (at least for me) to REALLY know what you're talking about. I manage large team in a large business, but fundamentally it's about expertise in the applied intersection of EMC and VMware technology. Having a home lab lets me do things that I wouldn't be able to otherwise. For example - Storage Vmotion right now is only offically supported in Fiber Channel configurations, but it didn't make sense to me (it is after all essentially: 1) ESX snapshot; 2) filecopy ; 3) reparent snapshot (filesystem operation), so I wanted to see how it worked on iSCSI based VMFS volumes and NFS datastores. I could ask someone to do it for me - but what's the fun in that! Using the home lab (which I can access anywhere in the world), I can quickly see how it works. Another key thing is it enables me to be hands on with EMC technologies and stay current - a hard task. Most software (and even a couple of arrays now - the Celerra, LifeLine, and arrays of the future) are available internally as VMs. I can just use VMware converter and import them to the cluster, and play with just about everything EMC produces, from backup tools, next-generation management tools, and arrays. Oh - and one more thing - occassionally (it happens every few months), I start "jonesing" to build a new rig, and this is an outlet. I find something very satisfying and relaxing about building the stuff. Love the setup. I have the initial components for a similar build out but on a smaller scale. Using 2 4U Chenbro cases I have configured a similar setup and I am working on getting a purpose built chenbro to through disks at and then run FreeNAS in a VM to act as my home NAS/Share. Going with the home desktop cases is cheaper but I am not a fan for a long term deployment. If I could convince the guys at Dell to send me an R900 like I run in my infrastructure I would be a very happy kid. Without that kind of pull I have to make my own. Glad to see other folks are doing this at home although your visitation stats must have gone off the chart when Twomey gave you a whole post. More than a little bit jealous. I am starting to build my ESX servers in home. I would download virtual Celerra so I can play around with my ESX 3.5, but just wondering if it is also worth it to spend the time in getting Openfiler as another virtual iSCSI flavor? Or should I make the efforts to get an external array as well? Thanks for putting this together, and thanks for letting me finally pay proper tribute to your work on my blog at http://vmetc.com! Great article! I am in the process of building a lab at home, so this article prove very timely for me. I was very interested in your mention of a Virtual Celerra. I would very much like to tinker with one of those. How do I go about getting my hands on one? Thanks! Nice lab! i'am also interested in the Virtual Celerra. Keep up the great postings. I'm interested in the virtual Celerra too. Where can I get the VM? Thanks. Excellent article. Glad to finally find the source of the shopping list. I'm very close to setting up my ESX3.5 lab. 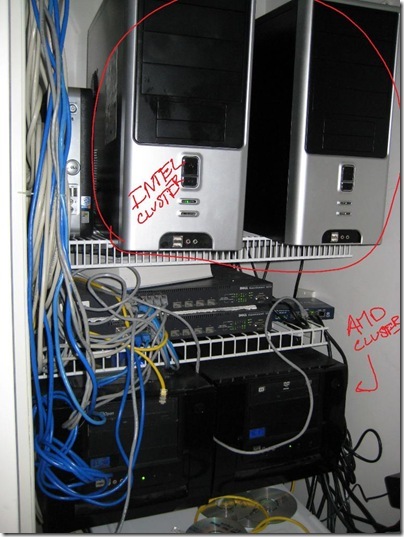 Eventually I'll build two servers so I'd like to go the AMD route because of cost. However, in reading around I get the feeling, compared to the Intel system, it's a greater risk of configuration gotchas. Can you recommend a current, under $100 motherboard from newegg.com that can still be purchased? The posted recommendation has been deactivated from newegg. It needs to be have its SATA, NICs, and Video to be ESX 3.5 compatible. Of the three, it seems that getting SATA to work off of the motherboard is the trickest. I need it to be capable of RAID0 across two or three disks. ESX & VMFS would need to be installed on the same set of disks. Also, the motherboard should be capable of going to at least 8GB. Thanks ahead for any suggestions. just moved into a new house, hope i can build a home-lab like this. although the neighborhood will probably notice the power-dip when I switch on 4 SAN's at the same time :-) Looks amazing. I'd be interested in seeing the Virtual Celerra app. I've played with Xtravirt's san app, and openfiler but it would be nice to see the EMC app since we have been looking at the celerra line as a replacement for our current SAN (older dell/EMC branded FC box). I setup a 2 box HP D530 "cluster" using the Xtravirt SAN VMs and its pretty impressive for what its running on. The funny part was ESX 3.5 installed on those boxes quicker and easier then Windows XP will! Fantastic article. I can't believe two things, that you had the time to build it all and that you have an understanding enough family to let you get so deeply involved with a home rig. Please count me in for a copy of Virtual Celerra please. I've used OpenFiler in the past but I'm trying to keep the box count down so the Virtual Celerra app sounds perfect - is it still available? If so, please could you fire a copy over? i used port 1 (orange connector) on the mobo for my SATA drive. for storage, on my core machine (not vi3 box) i have vmware workstation (thanks VCP) which i downloaded freenas and setup a couple of NFS shares. this worked just fine. i then built a dedicated gbe connected NAS box using freenas again with a spare 80gb SATA drive formatted up as NFS - the physical box is HEAPS better performance but nothing like FC SAN - a CX3-40 is not in the budget and my missus is not understanding. Also - for those looking for a new motherboard (the original ones were a bit dated - I'm going to do a new shopping list eventually, but already some stuff is updated. This is on sale right now for $65 USD. Nice, 8GB support, newest CPU support, stable, fast. Confirmed the SATA to work out of the box with ESX 3.5.0.64067 and later. Onboard NIC doesn't work, so you need to get the intel NIC I posted in the shopping list. the other bummer is that it doesn't have onboard video, but any cheap video card will work fine. It has onboard video, so you're good there. Note that it has a realtek MAC/PHY, so the LAN won't work, you need the Intel card I spec'ed earlier. What's crazy is it supports 16GB of RAM!!!! It would be madness to do that at this point (will cost more than $1000 just for the RAM) - but you've GOT to know that the ram prices are going to drop. It's amazing how cheap the AMD configs are. UPDATE: Chad here... We haven't been able to get this BIOSTAR TForce TF720 motherboard's SATA controller recognized, so for now, take it off the list, use the older 680 motherboards we've gotten to work.. I'm going to keep poking at it, but for now - stick with the older boards in the original config. After reading this article http://it.anandtech.com/IT/showdoc.aspx?i=3263 I figured it was best to go with a newer cpu. It seems every year the virtualization extensions get more efficient. So, I opted for your Intel Quad Core recommendation + EVGA nVidia 780i. After downloading the ESX 3.5 Update 1 82663, installing it, reboot....the system reports "Mounting root failed". I've tried it with and without RAID, twiddled numerous BIOS settings, upgraded the bios but all to no avail. You mentioned that people have been successful with this motherboard and sata drives. Would it be possible post their configuration settings and setup tips? I would like to avoid buying any more hardware (i.e scsi/sata controllers) or booting of a memory stick. Any help would be much appreciated! "1 ESX on an EVGA 780i, dual-booting Vista (which runs on a RAID5), running on a SATA drive native, 8G ram, q6600 quad core. This board has 2 nvidia nics. 1 ESX on a XFX 680i LT board, 8G ram, q6600 quad core, running on a SATA drive native. This board has one nvidia nic, and I added a PCIE Intel Gig nic. 1) Setup a single SATA with no RAID. 4) On the first reboot, select the Service Console only (troubleshooting mode) boot option. 5) Let the host boot up, then log in. Any updates regarding the new shopping list that you mentioned in your 06.24.2008 post? I'd also like to know if you have received any feedback on the replacement AMD motherboard (http://www.newegg.com/Product/Product.aspx?Item=N82E16813138117) that you referenced? Any problems with this motherboard's SATA controller? I look forward to your reply. Thanks for all of your contributions to the virtualization community. Best regards. If your proposal to Richard is universal, I will likely take you up on the offer this week. I sold my old ESX lab to a coworker who is preparing for his VCP exam, so I need to build 2 more servers. I like the motherboard you spec'd as it has enough slots for me to put 4 NICS in it for more flexibility. I would be putting 8GB of RAM in per server to start off. Thanks for being a great resource. Are you going to be at the EMC booth during VMworld 2008? One question - is there an big performance difference between AMD and Intel dual/quad CPUs for a test environment? I plan on testing Exchange 2007 and System Center on my new ESX lab. Should I lean toward AMD or Intel? "I find something very satisfying and relaxing about building the stuff." Putting together a home lab where you can fiddle around with technology is a must, even if your job is more business focused. 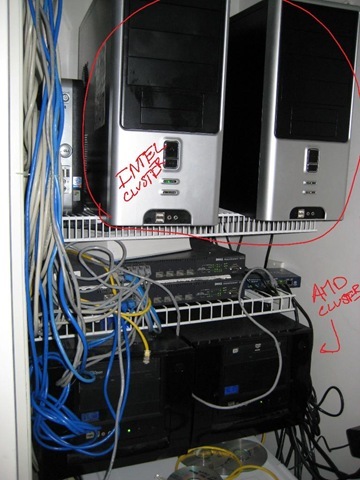 The ESX lab in my basement should be nominated for "the cheapest lab" award, but it works all the same. Dell Inspiron 8200 Laptop (about 6 years old) It only has 2x40GB drives and can't boot from USB. I had to turn one drive into the Open-E boot drive. BTW - built in a couple days with stuff laying around on the floor. I purchased components to make two ESX rigs using the Biostar TF720 you suggested. I have run into a few snags. First issue is that the ESX install hangs at "running /sbin/loader". I am able to get around this by installing using the "esx noapic" command. From there it doesn't see my SATA drive. I am currently trying to get around that one. I am trying to download the latest ESX build but VMware is doing maintenance today and I can't get anywhere. I have gotten the system to boot up and install the latest build of ESX to an IDE hard drive. No SATA so far. I had flash the BIOS and then disable APIC in the BIOS. I also had to use the NOAPIC switch to load ESX otherwise the install hangs when the Intel NICs load e1000.o. I am getting red messeges on the console saying that the "AMD Family 10h stepping B2 is not supported" and "Using PIC, make sure that if 'noapic' is used, it is on purpose". I don't think either are hindering performance much. Both may be repaired with future builds of ESX that could support both. That may also resolve the SATA issues as well, unless Chad can help me out. Let me know if that works. 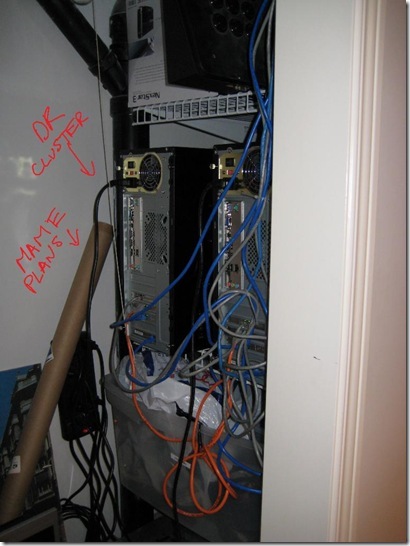 You shouldn't need a newer ESX build. Thanks for the tips Chad. Here is the issue...maybe it is my misunderstanding. If I attach an 80GB SATA drive to the controller and boot to the ESX cdrom for setup, ESX doesn't see a hard disk to install to. I can install to an IDE drive, but there isn't a partition for VMFS then. After an installation to IDE, the storage tab in the VI client doesn't show the sata controller or drive. I think this is a different scenario to what you suggest. Or am I wrong? From the ESX console I issued the lspci command. It does not list a SATA controller anywhere in the list. Thoughts? Ok, that said - can you try the MCP55 setting (037e and 037f)? Not sure if Nvidia updated the SATA controller from the 680 to the 720, but I doubt it. "Class 0106: nVidia Corporation: Unknown device 0ad4 (rev a2)"
"00:09.0 RAID bus controller: nVidia Corporation: Unknown device 0ad8 (rev a2)"
0ad8 isn't in the list. I am assuming this is my SATA controller. I edited the sata_nv.xml and changed the last entry to be MCP55 with the address of 0ad0 and then ran esxcfg-pciid, then rebooted. ESX saw the controller, but no targets were seen. I then changed the name to MCP785 but there was no love. My concern is that ESX doesn't see the SATA controller on install...or it is not seeing my drive. I am not sure which one. I am happy that Kubuntu sees the SATA components fine, which leads me to believe that the ESX kernel isn't new enough to see my hardware. I should have noted in the above post that I built my second ESX server whitebox and ran the tests on ESX installed to an IDE hard drive. Thanks. I will indeed be at VMworld. I am coming in on Sunday and heading to a Vizioncore welcome event :) I appreciate your offer, but these are two screaming machines for what I paid and I am happy with them. I can run IDE for now. Let me know when you will be at the EMC booth and I will stop by with my thumb drive! Just to note www.etherboot.org has roms which can be flashed onto nics (works a treat for the Intel Pro/1000's $30-$50 on ebay) and enable boot from san (like a HBA). EMBoot have similar but costs $100 plus, I believe. I setup an OpenSolaris x86 box with loads of 500gb Sata drives to behave like a SAN. ZFS and RaidZ are interesting to play with especially when trying to snapshot vmdk's (and raw os images also). Have you any PXE setups? Would appreciate some feedback when you have time. Fellow EMC (RSA) geek here with my new home config.
. 1 LSI Logic SATA hardware RAID card. So far, so great. I converted my old Linux server to a VM. Moved my VPN and ESVA spam filter VM's over. Installed a FreeNAS VM. The system boots ESXi off a USB stick. VirtualCenter runs in a VM on a laptop that runs VMware Server 1.x. I used to debug/QA Scott Davis' code when we worked in the VMS group at DEC. It would like much simpler to use, vmware workstation and openfiler to set up vmware esx infrustructure. Loads of tutorial online, like xtravirt. Was there ever any successful resolution to using the Biostar TF720, or is this simply a victim of esxi not having the proper SATA drivers for the MCP78S controller? Sorry for dredging up an old post, but google isn't very forthcoming on esxi biostar tf720 information! oops, wrote too much, was cut off by formatting as well, just add the slash and arrow signs appropriately. 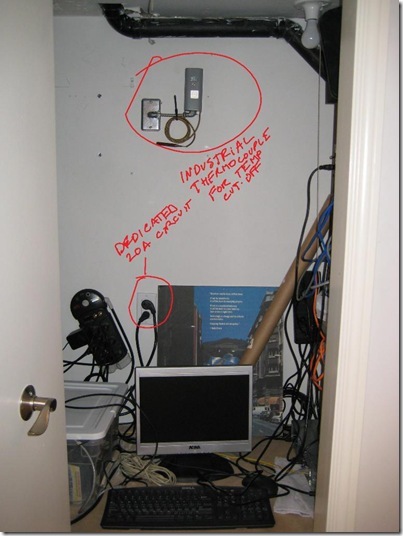 You'd posted an updated "record cheap" dual core 8GB config on Jan. 5, 09. That link isn't working anymore. I'd love to see the hardware list if you have it. Chad, what success have you had with these "servers" running vSphere4. Also if you want to remotely rebuild the ESX hosts - what are using in lieu of ILO/RAC board - an IP KVM? install went w/o a glitch.